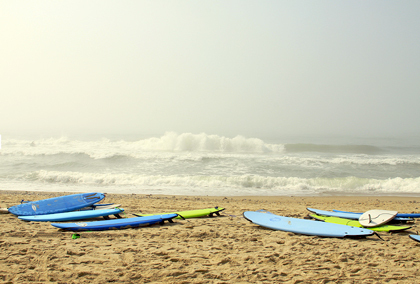 Montauk breeds a love for the board, so it follows that many of the town’s shops offer surfing lessons. Air and Speed Surf has been around for 15 years, and employs some of the East End’s finest for instruction on how to get up—and stay up when those waves come pounding. For pricing and bookings, stop by the store where you can ogle the boards in the hopes of success. Body Tech Health and Fitness 240 Edgemere Street; 631-238-5311 bodytechclub.com Located in the Montauk Playhouse Community Center, Body Tech offers top-of-the-line equipment from cardio machines to free-weights, and a wide variety of scheduled group fitness classes including spin and Pilates. Day passes can be had for $20 ($17 for hotel guests with key) while 2 and 3 days passes top out at $35 and $45. Located in Montauk Harbor, Dave’s Grill is the no-frills favorite. Here, it’s all about the clams and mussels, the grilled lobster and lobster rolls, as well as a list of daily catch specials. Montauk is known for their seafood, and Dave’s Grill is, hands-down, the best place to sample it. Crow’s Nest Inn 4 Old West Lake Drive. 631-668-2077 The divey Crow’s Nest got a facelift this summer—a whitewashed interior and a simple menu focused on fresh ingredients like spaghetti with fresh tomatoes and roasted local fluke with potatoes. It’s first-come, first-served, but if you have to wait, the gorgeous lakefront property, bonfire, and cool crowd will make up for it. Navy Beach 16 Navy Road. 631-668-6868 navybeach.com Celebrating its second season, the nautical-themed Navy Beach draws diners for its beach location—complete with outside picnic table dining—its buzzing bar, and of course, a great menu. With a long list of small plates, salad, ceviches, and main dishes, don’t miss the tuna sashimi, the watermelon salad, and the ribs. 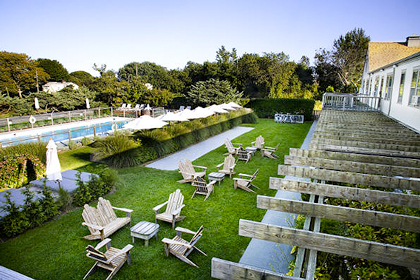 This indoor-outdoor surf hotel is Montauk’s original high-end concept hotel, restaurant, and bar. 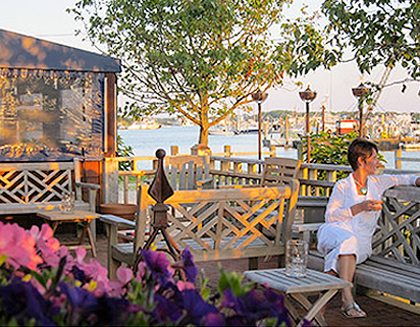 The large deck on Fort Pond is a great cocktail stop set against the din of a live band, and the cozy nooks that surround the property lend themselves to staying well past dinner at Top Chef contestant Sam Talbot’s breezy restaurant. On weekends, arrive early; this casual spot turns into quite the scene. Montauket 88 Firestone Road. 631-668-5992 montauksun.com/Montauket The beauty of a Montauk sunset is to be cherished, and there are few better places to take it in than at the Montauket. This dive, filled with both locals and passerby, serves just right bar food, $5 beer specials, and a view overlooking Fort Pond Bay that beats the competition when it comes to drinking yourself through happy hour. Ruschmeyer’s 161 Second House Road; 631-668–2877 visitruschmeyers.com Sporting a summer camp feel, Ruschmeyer’s is the latest one-stop spot to chill. 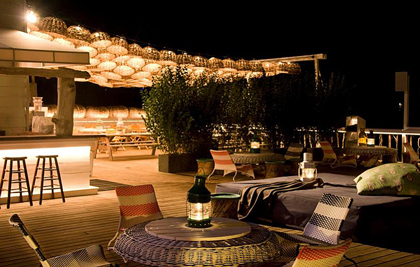 The restaurant, from the team behind NYC’s The Fat Radish, sits next door to a disco serving maritime-themed spirits, while the sand-filled Pool, an outdoor beer garden, offers ping-pong, bocce ball, craft beers, punch bowls, and weekly acoustic performances. The laid-back backyard complete with pool, grassy spaces, and swanky beds for lounging is the draw at this 67-room boutique hotel. The suites and the bungalows are the most desirable digs, and the restaurant, aptly named Backyard, is worth a visit. If you prefer a beach property, Solé East also has an outpost off Main Beach. Montauk Yacht Club 32 Star Island Road. 888-MYC-8668 montaukyachtclub.com Established in 1929, Montauk Yacht Club is a beloved slice of Montauk’s past and present. With 107 guestrooms, including some gorgeous stand-alone villas, this blue and white marine hotel is the crème de la crème of lodging. With two restaurants, a spa, LCD TVs, Keurig coffeemakers, and off-room balconies, if you can snag a room here, book it!